Quite simply, it means Earthquake Hazard Reduction. 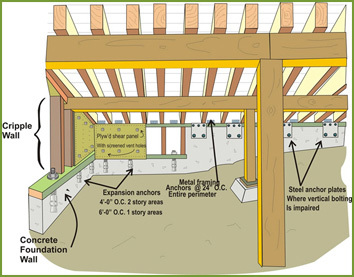 Earthquake retrofit for wood frame buildings addresses what is known as “The Earthquake Weakness“ -which involves the attachments of your home – to its foundation. Seismic Safety evaluates and performs foundation reinforcements that will reduce the risk of earthquake-induced damage to your home. To know more about the earthquake retrofitting in Southern California Call us at 626-791-2300. 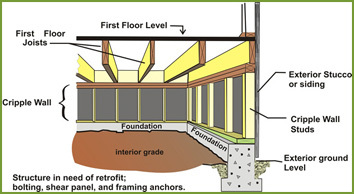 Why Seismic Retrofitting is important to your house? Recent earthquakes have shown that if a building has weak cripple wall bracing or is unbolted, it may slide off its foundation even in certain moderate earthquakes. Our Seismic Retrofitting experts have seen buildings whose Cripple stud walls have toppled over, and the buildings have collapsed and slid. Fallen buildings may catch fire or need extensive repairs to restore occupancy requirements. Is your Home Earthquake retrofitted? Are you at risk? Prior to 1960, a large number of wood frame residential buildings were built with raised wood floors supported by short wood stud walls known as cripple walls. These cripple walls are typically braced with weak seismic materials such as stucco or horizontal wood siding. In addition, wood frame buildings built under building codes in effect prior to July 1938 were not required to be bolted to their foundations.